When it snows out, I play John Coltrane’s “My Favorite Things,” a tradition that dates back to 21 years ago today when I returned to my apartment on Bleecker Street, got caught in a blizzard, and watched the city go silent. I owned two CDs back then: John Coltrane and The Black Crowes, and snow in Manhattan felt more Coltrane than Chris Robinson, plus “My Favorite Things” is a 17-minute song, so that’s ample time to sit by a large window and watch the snow fall. More than 20 inches fell on New York City between January 6-8, 1996, still among the best two-plus days I’ve ever enjoyed in Manhattan. I ordered Indian takeout. Outside, I walked Greenwich Village and watched people cross-country ski down Bleecker Street, as if they had been waiting for this moment for years. No one honked their horns because the cars were stuck. People threw snowballs and waved at each other. 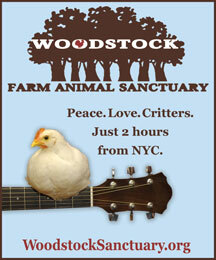 It was the most laid-back side of New York City I had ever seen. I am playing Coltrane now, though we woke up to barely an inch of snow. As someone who grew up in the Snow Belt, this is quite unimpressive January weather (so far). During my childhood, winter wasn’t so much a season but a state of mind, one that involved time, preparation and equipment: the extra five or ten minutes to get into a snowsuit and boots; how I had spent all fall stacking wood for our wood-burning stove; the purchasing of rock salt; making sure the shovels could take another round; ensuring the snow-blower still worked; that we hadn’t outgrown our boots yet; that we had cans of Campbells soup somewhere in the cupboard in case we got snowed in and the grocery store was closed, because at the time there was only one store in town (and yes, it was Campbells—I can’t even look at the Warhol version without thinking of how salty that soup is). Snow piled up in feet, not inches. There was a hunker-down mentality to my childhood winters that I’ve always resented, and I’ve spent years distancing myself from them, despite the fun I had sledding down huge hills. Last Friday, I was in Ybor City in Tampa, Florida, where it was around 65 degrees, and folks were bundled like the “Big One” was coming. Heavy scarves, long sweaters, hats, boots, coats. I get that Floridians, and Southerners in general, don’t do snow. They hunker down for hurricanes, a shared, but different mentality altogether. One of our waiters, who was originally from Georgia, joked with us how he keeps meaning to drive north to see snow, but when it gets to be around 60 degrees, he chickens out. I thought about this notion—driving a long distance to see snow, and here I was having just driven 1,300 miles to warm up on a beach. A friend of mine who lives in Phoenix drives her kids 170 miles north to Flagstaff to take them sledding. When I was a kid, I was always jealous of my classmates who could afford to go to Florida for school breaks (and it was *always* Florida). Intense sunshine, powdery beaches and palm trees were as curious and exotic to me as snow was to this guy. 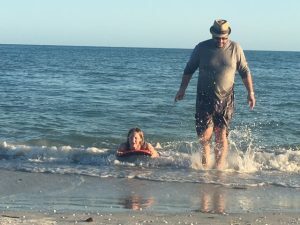 So here I was, living out my Florida fantasies over the holiday break—doing exactly what I had always wanted to do as a kid. Originally, I had wanted to stay on Sanibel Island, but the rates were too high and the restrictions too many, so instead I lucked out with this awesome house attached to a private pool in Cape Coral, only a half-hour drive from Sanibel. 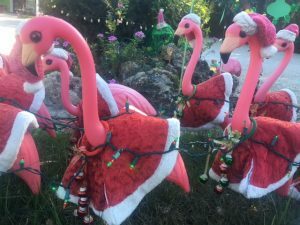 I loved the Cape Coral neighborhood because it wasn’t travel brochure-Florida—it was Florida-Florida: manatee-shaped mailboxes, plastic flamingos everywhere, dolphins etched into glass doorways, very tanned, white-haired people walking dogs. Florida was my happy lamp last week, so I spent mornings walking around the neighborhood, and once, a young guy heading towards a pickup truck greeted me hello while holding a rifle in each hand. Yep. I had the real deal. Sanibel Island didn’t disappoint either. We went to the beach a number of times last week, including a beautiful stroll on Christmas Day. This was my first “warm” Christmas, and I reveled in Florida’s quirky mix of inflated polar bears and palm trees, its plastic candy canes jutting out of sand. 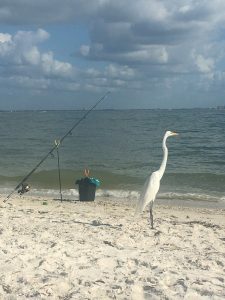 We saw egrets trying to wait out the fishermen, and we saw dolphins swim past every time we went to the beach. Sanibel is known for its seashells, and there’s a posted guide displaying different shells and their names, which reminded me of being in the cosmetics aisle reading lipsticks thinking: “Which is more me, Red Hot Lover or Pretty In Pink?” I found an Atlantic Kitten Paw and a Florida Spiky Jewel Box. 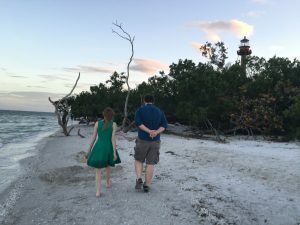 I only took a few shells home as souvenirs; I saw people carrying buckets of shells on the beach, and the roads in our Cape Coral neighborhood were a mix of asphalt and crushed shell, so perhaps seashells aren’t a limited resource—I don’t know. But I didn’t want to be greedy. I “shelled” because “shelling” on Sanibel is a very active verb, and I walked the edge of the Gulf of Mexico admiring the variety of shells. 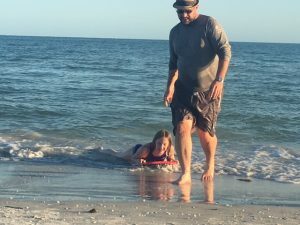 The waves off Sanibel weren’t ideal for boogie-boarding, so Mike dragged our kid across the water the way he used to pull her on her sled across snow. Throughout the week, the Sunshine State lived up to its name; it was in the 80s, abundantly bright out and warm enough to use our private pool almost all hours of the day. Except for last Friday, the day we went to Ybor City because I wanted to take my half-Spaniard husband to Columbia Restaurant, a Florida institution I had visited the previous year. This time, Columbia felt far more touristy than I had remembered. Maybe this was because of the holidays? We had reservations for dinner and flamenco dancing. At the table next to us, an older gentleman loudly asked his companion if it was “Flamingo or Flah-min-coh” dancing, and the companion had to correct him: “It’s ‘flah-mehn-co, not flamingo like the bird.” I kid you not—that was said out loud—very out loud—at the table next to me, and I was amused and slightly nervous because I knew then we were in for something marketed to tourists. Sure enough, the lights dim, the dancers come out dressed in bright gowns and wearing bright silk flowers in their hair, and they start dancing to “Sleigh Ride” blasted from an aging soundtrack system, keeping the rhythm of “Sleigh Ride” with their castanets. I burst out laughing, and then did all I could to maintain composure during the performance. My husband, whose father was born in Madrid and apparently didn’t speak any English, look horrified, which made me laugh even harder. We honeymooned in Spain, and had seen gorgeous flamenco dancing when we lived in Washington, D.C., and a troupe from Spain passed through. I had also recently seen beautiful flamenco dancing while in Havana in May. None of these past experiences involved a soundtrack. Flamenco dancing is a few women in dresses that crest and fall like ocean waves, castanets strapped to dancers’ fingers, and usually one guy dancing with them, another guy playing a box or a chair or some makeshift drum, and always—always a dude furiously strumming a guitar like it’s his last day. Our daughter, who had never seen live flamenco dancing, looked confused and kept asking why I was trying to stifle my laughter. Repeating “Mom, what’s so funny? ?” while dancers are on stage trying to do their job is as awkward as it sounds. I had brought my family to a tourist trap. Playing castanets to a Muzak version of “Sleigh Ride” was meant for guys in the audience who can’t pronounce “flamenco.” The dancers were quite good, and the whole thing would’ve been better if they shut off the cheesy soundtrack, which, they eventually did. A skinny guy in a red shirt and tight black pants came on stage and saved the day with his singing and dancing, and my husband’s posture softened. A few minutes of something authentic-ish. Honestly, I wouldn’t trade the experience for anything. It just added to the weirdness that is Florida. And, it humbled me. I can take my family down Seventh Avenue in Ybor City, past its bars, the hookah lounges, the tattoo parlors, I can buy a cloche hat from La France, crave a Cubano sandwich I can’t eat because it’s not gluten-free, and convince myself I’m having a cool, authentic experience only to spend that same evening sitting before a stage of flamenco dancers working their assess off to “Sleigh Ride.” It was the perfect Friday night in Florida. You should try it sometime. 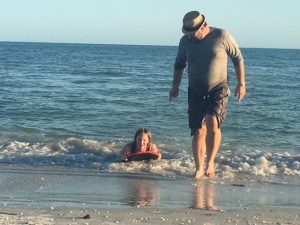 This entry was posted in America, Florida, Holidays, Travel and tagged castanets, Christmas, flamenco dancing, Florida, holiday music, holiday travel, Sanibel Island, Sunshine State, Ybor City on January 6, 2017 by katrina.